RV water pumps make life easier on the road by pumping water when and to where you need them. But they do break down sometimes, and then, you need a replacement. 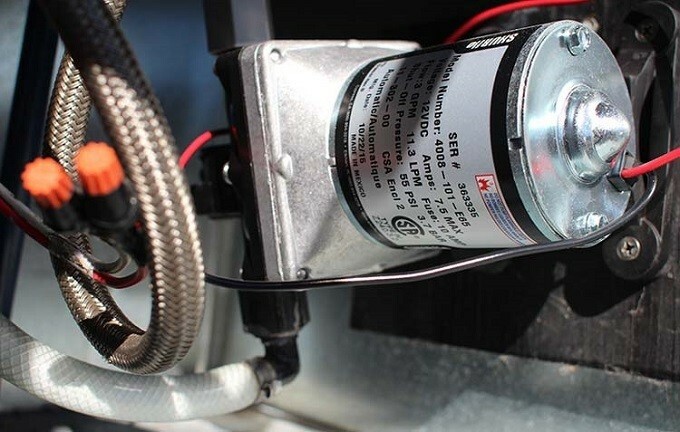 Given the capacities of the pumps in the market and the different sizes and plumbing systems of the different RVs out there, it's obvious that you need the right information to get it right the first time you replace a pump. This RV water pumps review offers you the information that you need to make the right choice, plus a list of the top offers in the market, to make it easier for you to choose. 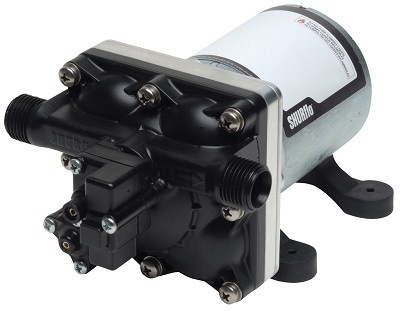 The Shurflo 4008 series is a well-built and reliable water pump that operates very quietly and comes with other very impressive features. It's a self-priming pump, thermally-protected, and can run dry without any issues. People also love this pump because it's easy to install and you can even install it in any position you like. 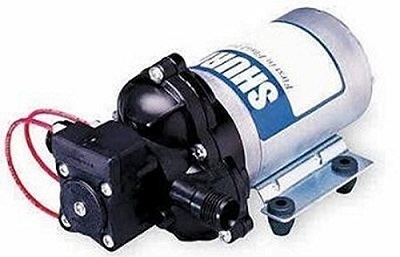 When it comes to power consumption and efficiency, this Shurflo pump also shines. It uses up to 7.5 Amps to pump up to 3 GPM of water and shuts off at a top pressure of 55 PSI. It will restart at 25 PSI and it additionally comes with thermal overload protection and a 2-year warranty. Here's another water pump from Shurflo's 4008 series, but this time it's the model A65, which is identical to the previous E65 aftermarket model. This A65 is the OEM version and is slightly cheaper than the E65 aftermarket model. On the flip side, it comes with only a 1-year warranty, which is less than the E65's 2-year warranty. It's also self-priming and will pull water on the suction side up to a 10-ft. head. On the push side, you get much more pressure and about 100 ft. of head. Using 7.5 Amps of current, it pumps 3 gallons of water per minute and has a 55 PSI internal bypass. Other features include quiet operation and thermal protection. 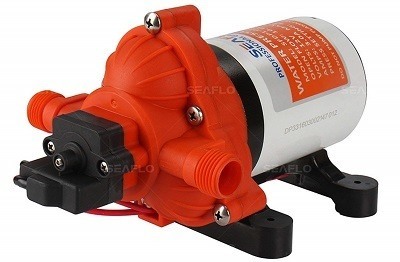 This Shurflo 2088 series is another top-rated RV water pump, designed to pump up to 3.5 gallons of water per minute, using just 4.5 Amps of electric power. It features a 3-chamber diaphragm design and includes a 45-PSI shut-off switch, which cuts back in at 25 PSI. The motor features thermal protection and a check valve prevents reverse flow. This water pump is self-priming up to a 9-ft. Head, it's NSF certified for use with potable water, and Shurflo backs it with a 1-year warranty. 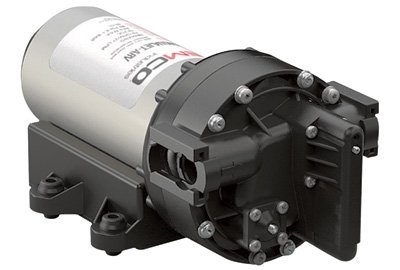 Choose this offer if you want an energy-saving water pump that's lightweight and additionally versatile enough to allow both horizontal and vertical mounting. This Flojet offer is one of the best RV water pumps that you'll get in the market, for its many beneficial features and advantages. This starts from its corrosion resistant design, which makes it last longer and to withstand different fluid concentrations. It also comes with noise absorbing mounts, to help reduce its overall operating loudness. You get a self-priming pump with three chambers and suction lift up to 9 feet. It can also run dry without problems, and Flojet backs it with a 2-year warranty. It's worth noting, however, that while this water pump gets made using corrosion-resistant materials, it's in no way a substitute for real marine or salt-water pumps. It will handle a little salty water, but it wouldn't last long in such conditions. 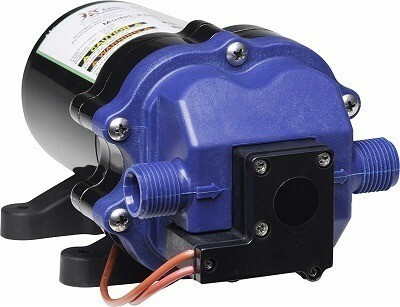 The unique feature about this water pump is that it offers a variable speed function that lets it adjust the pumping speed to match the current water demand. On one hand, it's a high volume pump with a 5.3 gallons per minute flow rate and 65 PSI of pressure. On the other hand, it adjusts to the situation. It comes with a five-chamber design and is relatively quieter than comparable water pumps. It shuts off between 75 and 85 PSI, which is higher than previous pumps in this review, so get it if you want a high-pressure RV water pump. This is the ideal pump for larger RVs. It has a top suction lift of 14 feet, is self-priming, can run dry, and it comes with a 2-year manufacturer warranty. Here's another interesting offer for those on the search for the best 12V RV water pumps. This one comes with a 3-chamber diaphragm design and is ideal for all kinds of water pumping jobs. It delivers 3.0 Gallons Pr Minute at a 45 PSI water pressure, which is ideal for most small to medium-sized RVs. You can also tweak its shut-off pressure level, to further customize it to your needs. 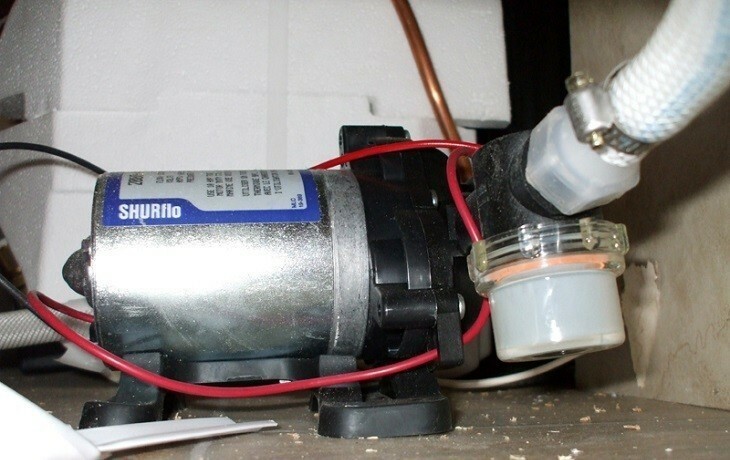 The pump is self-priming and can run dry without issues. Seaflo includes an inlet strainer and adapters for barbed hoses in the package. This pump is additionally backed by a 4-year warranty, the longest so far in this review. When used on smaller RVs, you can tweak down the pressure to save power, down to where the pump consumes just about 3 Amps. Designed for very quiet operation at a just 3.0 Gallons Per Minute flow rate, this Artis Series water pump from WFCO additionally features corrosion-resistant construction materials. It draws up to 7 Amps of current at 30 PSI of pressure and shuts off automatically at 40 PSI, making it an ideal pump for smaller systems and campers. Further features include self-priming up to a suction height of 6 feet, a sealed motor design, and a patent-pending diaphragm design with four chambers, which helps the pump to also run dry without getting damaged. What this package lacks, though, are accessories such as a water filter to prevent debris from damaging the pump. This pump also includes thermal protection, back-flow prevention, and it comes backed by a 2-year manufacturer warranty. With a flow rate of just 1.2 GPM and a shut-off pressure of 35 PSI, this is without a doubt, the weakest RV water pump so far in this review. But that doesn't mean it's no good. On the contrary, it's the best RV water pump for those with small campers or boats. If you've got a mini RV, then you need this mini RV water pump to fit into your rig. It also measures only 6.5 inches in length and weighs a little over 1 pound. Still, it's self-priming and can deliver suction heights up to 4 feet. There's built-in thermal protection, a pressure switch that's fixed at 35 PSI, it is run-dry safe, and Seaflo backs it with an industry-leading 4-year manufacturer warranty. You may not really want a water pump, but rather, a pump for waste removal or something similar. In such a situation, this offer from Flojet will get the job done. It's a portable system that comes with a plastic carrying case and includes a remote handheld switch. This macerator will cleanly handle your waste disposal from your holding tanks to wherever you want it to go. The pump is self-priming and can run dry for up to 30 seconds. This allows for this pump to get installed above the tanks. 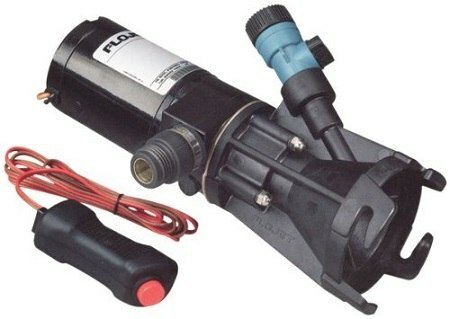 Flojet provides no power or flow rate information, but it backs this macerator pump with a 1-year warranty. Here comes the smallest and the quietest RV water pump in this review. Measuring less than seven inches in length, it delivers only 1.1 gallons of water per minute, which is perfect for many small RVs, campers, and boats. This pump's cut-off pressure is 35 PSI and it is self-priming to about 4 feet of head. It can also run dry without damage and it features thermal overload protection. Another important feature of this pump is its very quiet operation. It draws little current to work and includes soft rubber mounts for quieter operation. If you looking for an energy-saving pump or if low noise is important to you, and low water flow isn't a problem, then take a closer look at this offer. RV water pumps are unique devices with a specific purpose, and this makes it necessary to learn a little about them if you want to make the right choice. Following are important features and factors to consider when you're picking an RV water pump for your camper. A pump's flow rate is a method of measuring how much work it does in a given period, and since the pump's job is to pump water, the amount of water that it pumps in a given period is its flow rate. The flow rate for RV water pumps is usually given in GPM, which stands for Gallons Per Minute. Larger, residential pumps can also get measured in GPH (Gallons Per Hour), but for RV purposes, GPM is enough. A flow rate of about 3 or 3.5 GPM is often enough for most RV purposes. If you're changing an old pump, then it's easy to look on its label for the right flow rate and then, stick to it. 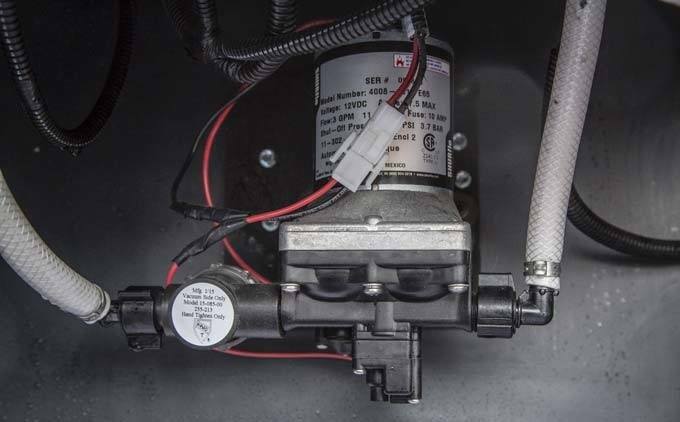 You don't want to get a pump that's either too powerful or too weak, as it may either cause problems in your camper's plumbing or drain the battery. Water pressure gets measured in PSI, which stands for Pounds per Square Inch. It's closely related to flow rate but it has a double function when it comes to RV water pumps. The first function is that a higher water pressure means an increased flow rate, and this lets you get enough water around your camper. A range of 60 to 75 PSI is ideal for most rigs. The second function is with the on-demand feature of RV water pumps. They measure the pressure in the pipe and will stop pumping if it's higher than a given threshold, such as when you close the faucet. The pump will also resume pumping once the pressure falls below another threshold. So, if you open a faucet, the pressure falls and the pump switches back on. Most RV water pumps run on the 12 Volts power supply that you find in automobiles. So, the difference between the models here is their current consumption. Current gets measured in Amps and when multiplied by 12 Volts will give you the power consumption of the pump in Watts. While most RV water pumps have their power consumption in acceptable ranges, you may want to opt for a lower-powered version if you've got power consumption issues. All RV water pumps will produce a certain level of noise, but they are usually within tolerable limits. This makes it unnecessary to worry about the noise. If, however, you end up with a very noisy RV water pump that you can't bear, then it's probably broken. If it's still under warranty, then it's best to get it replaced. You also need to keep an eye on the pump's energy consumption because most RVs only have so much energy to offer. So, what you need is an energy-efficient pump that delivers as much water as possible, using as little electricity as possible. Sine nearly all RV water pumps run on 12 Volts, you'll just need to look at how much current the pump draws, which is given in Amps or amperes, then compare it to its flow rate, which is given in GPM. A good product usually comes with a good warranty and often at a higher cost, as well. So, it's left for you here to choose your balance between price and quality. Remember, however, that when your water pump breaks down beyond repair, it might be a good time to replace it with a new one. Following are the most frequent scenarios and questions, followed by their troubleshooting and fixing guides. Question #1. I can hear the pump working but water isn't flowing, what do I do? Ans: There are many reasons for such a situation and it can include a low water level in the tank, an air leak in the suction line, a punctured pump diaphragm, or a worn-out pump impeller. You'll need to troubleshoot the system to find out which of the reasons is responsible. First, check all the water lines to make sure they're not clogged, then the hose clamps, drive belt, and other parts of the pump. Question #2. The pump doesn't run at all. Ans: If you open a faucet or the shower and the pump doesn't go on at all, it could be a result of either a bad pump motor or issues with the electrical system and wiring. Check to make sure that the master switch is actually on. Also, make sure that there's no blown fuse and that the battery has enough charge to power the pump. Then check the overall wiring of the pump to make sure that nothing is loose. Question #3. Why does the water pump cycle on and off with closed faucets? Ans: When this happens, then the pressure switch has either become defective or there's a leak somewhere in the system. To solve the problem, check that there are no water leaks. Check the faucets, toilet valves, internal pump leak, and other parts of the plumbing lines that could possibly be leaking. Question #4. Why does the water from the pump sputter? Ans: Sputtering water means one thing and that's air. You'll need to find the source of air in the air and get rid of it. There could be an air leak in the suction side, or in the lines somewhere. You'll need to repair any leaks and bleed any air in the lines. Question #5. My pump is too loud, what's the problem? Ans: Worn out parts and loose mounting bolts are often responsible for loud RV water pumps. The pump's intake line could also be restricted in one way or the other. Check the pump and tighten all loose bolts and drive pulleys. Make sure that the pump is properly installed according to the manufacturer's instructions and replace any worn out bushings with new ones. We've reached the end of this RV water pumps review but there's no product recommendation because all the best pumps you saw above are each designed for specific purposes. It's left for you, therefore, to make your choice, because you are the only one who knows which water pump offer best meets your RV or camping needs.